In this competitive age of the technological evolution, every business is now focusing on a unique strategy for improvising online visibility. If a business needs to survive, we must focus on online marketing strategy rather than traditional marketing. Digital Marketing has become the backbone of any sector. To develop a successful digital marketing strategy business must focus on marketing content. It plays a vital role in encouraging attention of any customer towards products or services that business offers. The content must be unique so that it can positively engage. 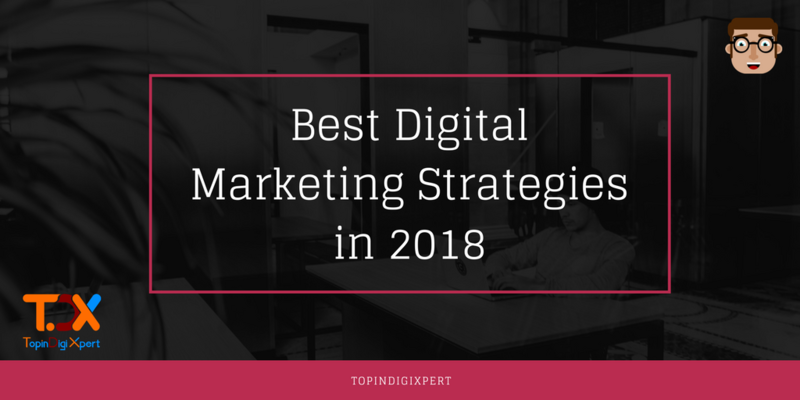 A recent study showed that old digital marketing strategies such as advertising on TV, radio, newspapers have become extinct, as this period is of computer and mobile age. Every business is now focusing on quality of service. A survey shows that whole world is now focusing on content marketing and for making their website mobile optimized. Nowadays, no one is going to examine or trust on banner ads. 60% market is nowadays focusing on Inbound Marketing that is indirect strategy marketing that a customer is going to attract towards a company, dealer or agency which can be done via SEO, Social Media, Content Marketing, Email Marketing, Search Engine Marketing, Social Media Monitoring, SMS marketing, etc. So, let us look towards new trends in Digital Marketing. Until you host good content it is difficult to promote videos. Video marketing plays an essential role in sending traffic to a website in an active way. Social Media platforms such as Facebook, Twitter, and LinkedIn play a leading role in hosting videos. Hosting videos on such platforms have given a rise in the scale of visitors to the website. Video Strategy has become the strength of every business to attract and engage more users to their website. According to the video statistics survey, YouTube viewers watch a billion hours of videos each day. Facebook users consume over 8 billion videos every day. 82% of Twitter’s audience views video content on the platform. One thing to keep in mind that mobile comes first. After all, 90% of Twitter video views and 60% of YouTube views are now from users on mobile devices. The marketing society has seen the writing on the wall, 65% of marketers are preparing to increase their budgets for mobile ads to focus more on video within the next few months. Influencer marketing is a suitable sort of marketing that links on using key figures to drive your brand message for the marketplace. Rather than marketing directly to a large group of consumers, you instead motivate or pay influencers to get out word for you. What is new for Influencer Marketers on Social media 2018 ? For avoiding the pressure of competing with rival brands, marketers will be looking up to develop more long-term relationships with essential social media influencers in 2018. Another, important aspect of influencer marketing concern this year will be security. Customers can simply recognize influencer-brand collaborations that seem ordered or request them why savvy marketers will be a focus on expanding organic relationships with influencers that suit their brand in 2018. The fundamental law for additional technological or powerful tools in an industry is ready to build a notable variation in Influencer marketing which is enhancing a true effective marketplace. The demand (which, in this scenario, is the brands, agencies, marketers, company, agency, etc.) will begin to meet the supply (the hundreds of thousands of influencers creating content every day). It will increase company’s brand adaptability and overture the transformation into a huge market. It is the age of competitors to show their graceful content. In 2018, the European Union is getting serious about companies collecting consumer data. On May 25, 2018, the General Data Protection Regulation (GDPR) is going into effect. Isn’t your company prepared? Primarily, the GDPR gives EU citizens more security over their private data. Every time a company wants to collect information from a consumer, they’ll now need explicit consent from the individual. The data could be anything from their location, name, and email address. On top of that, the company will need to tell the person what data threat their plan to collect and how they’ll use it. I know what you’re thinking, if my business isn’t in the EU, no problem, right? Well, the GDPR is suitable for any company that manages data on any EU citizen. And U.S. based companies are actually further ready for the GDPR than European ones, fewer than 75% of European companies will be GDPR obedient from May, in comparison to 84% of American corporations. What happens if your business doesn’t comply? It’s not sufficient regarding an EU penalty of relevant to 4% of global annual turnover or 23 million USD. Chat bots are being for years they are newly updated with AI integration. The 2018 year will be for Social Media branding that needs devising this year by new technological advantages and more advanced features that we used for customer support. Newly, chat bots are frequently used for customer service, 61% of Consumer Chatbot communications is from customer service associated issues. The future of bots is looking bright, too, with an estimated 85% of customer interactions managed by Chat bots by 2020. Chat bots can do a lot, they are added to the website, an application and even on a social media platform that delivers personalized experiences that, in turn, led to positive brand experiences. They also gather information as they engage with users, information that can then be used to better tailor marketing strategies. In other words, they’re another way for your audience to interact with your brand. Instagram started its individual life stories with a live board experience of video, image, important approach of pictures in the form. It’s the wow effect of the national geographic channel which supports pictures operating the real impact of the source to destinations. So, they have 81 million followers on Instagram. About using pictures with limited content, images itself provide details about what they convey to say. This is the art of storytelling beside real-time happenings that may shake content. Very interesting article. It help me a lot. Thanks for sharing such useful information. Surly i will adapt these strategies to rank my website. Nice post! I especially like the part where you talk about video uprising in 2018, I have personally all social media platforms and most of my traffic comes from Video, It definitely works like a charm. Keep Writing. I have checked your blog and i have found very useful content. After looking over a number of the blog posts on your web page, I truly like your way of writing a blog. I saved it to my bookmark webpage list and will be checking back soon.